Drinking tea is not for pleasure alone. It has a lot of health benefits and thats why Tea is the second-most consumed drink in the world, surpassed only by water. People have been drinking tea for centuries also because of its health effects. For those that have not yet embraced a tea-drinking habit, I am sure you will rethink about it after reading this. Antioxidants (flavanoids) present in tea protect your body from the ravages of aging and the harness caused by pollution. The high value of Oxygen Radical Absorbance Capacity (“ORAC”) helps in neutralizing free radicals generated in body. Studies have proven that these free radicals are the causes for DNA damages, mutations, aging, and degenerative diseases etc. 2] Intake of tea may reduce your risk of stroke or heart attack. Unwanted blood clots formed from cholesterol and blood platelets cause heart attack and stroke. Drinking tea may prevent such atherosclerotic changes and keep your arteries smooth and clog-free. Another study conducted in Italy by Dr. Claudio Ferri et.al showed that black tea reduced blood pressure in patients with hypertension. The study also shown that intake of black tea has also an effect on neutralizing the negative effects of high-fat meals on arterial blood flow and blood pressure. Studies also shown that drinking tea lowers metabolic syndromes. 3] Tea protects your bones and teethes. Polyphenols in green tea may help improve bone quality and strength. A study found that tea drinking was associated with a 30% reduced risk in hip fractures among men and women over 50 years old. Studies also shown that 4-6 cups of green tea daily, improved markers for bone formation, increased muscle strength and reduced markers of inflammation. Studies have found that green tea flavanols provide a restorative effect to bone remodeling to help maintain bone density and slow bone loss. Regular intake of tea can strengthen your teeth and lower the risk of tooth decay. Fluoride, which can bolster tooth enamel is abundant in tea. Also the antioxidants present in tea will help in destroying germs and bacteria in mouth. In addition the milk added to tea is a rich source of Calcium. 4] Tea hydrates the body. Although high in caffeine, tea is still great for hydration because it provides a rich and flavorsome source of water. 5] Tea helps you in weight lose. The antioxidants in green tea improves body’s muscle endurance by increasing its ability to burn fat as fuel and lowering calories. Thus it enhances exercise tolerance. Studies have shown that regular tea drinkers have low Body Mass Indexes (BMIs) and waist-to-hip ratios, along with less body fat, compared with non-tea drinkers. Also tea doesn’t have any calories, unless you add sweetener or milk. So if you’re looking for a satisfying, calorie-free beverage, tea should be your first choice. 6] Tea May Reduce Risk for Some Cancers. Thanks again to the high ORAC value of tea. The antioxidants in help protect against a lot of cancers, including breast, colorectal, lung, liver, ovarian, prostate and oral cancers. In a study the researchers reported that after 1 year, only 9% of men in the green tea supplemented group had progressed to prostate cancer whereas 30% of men in the placebo group had progressed. Though studies are promising, the current research on this topic is mixed. It is found that the drinking tea lowers the risk of Parkinson’s disease in both men and women. While many factors influence brain health, polyphenols in green tea is found to help maintain the parts of the brain that regulate learning and memory. So tea might be an effective agent in the prevention and treatment of degenerative neurological diseases like Alzheimer’s. Studies found that compounds in green tea could be beneficial to people with Type 2 diabetics because they process sugars better. Drinking tea may help your body’s immune system fight off infection. 9] Tea Improves Mood, Alertness and your Problem Solving ability. Drinking tea can contribute to both relaxation and concentration. Researches published in the American Journal of Clinical Nutrition found that drinking tea improved attention and allowed individuals to be more focused on the task at hand. 10] And a lots more. Improves your vision – 2010 Study found that some components in green tea positively affects the tissues of the eyes, especially tissue related to the retina. Can reduce stress – Studies found that black tea actually helped in reducing levels of the stress hormones in study participants. Can prevent ageing – Extracts in white tea inhibits wrinkle production by strengthening Elastin and Collagen tissues. White tea can also keep your joints younger. Counteract some of the adverse effects of smoking and might even lessen the risk of lung cancer. Water – Should have only a maximum of 150ppm of balanced minerals. Weight – 2 gms of tea powder per cup (250 ml) of water. 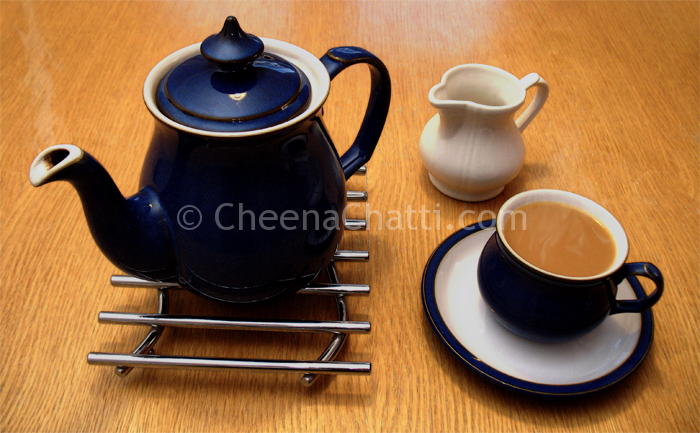 Temperature – The ideal temperature depends on the tea. Use boiling water when preparing Black, dark Oolong and Herbal teas and cooler water when steeping more delicate teas, such as Green, green Oolong and White teas. Time – The rule of thumb is 3-5 minutes for most black teas, depending on your preference for strength. Equipment – It should be prepared using a deep and wide bottomed vessel, so that the tea leaves have enough leg space to expand. Most important – Tea – Buy the best that is within your budget. Keep it fresh with in 3-6 months. I know your next question is – Which form of tea is the most beneficial for me? right? Let me explain. White Tea is essentially unprocessed tea. The name is derived from the fuzzy white “down” that appears on the unopened or recently opened buds – the newest growth on the tea bush. White tea is simply plucked and allowed to wither dry. White tea has a very high polyphenol count which helps you keep young. Green Tea is plucked, withered and rolled. It is not oxidized during processing. The liquor of a green tea is typically a green or yellow color, and flavors range from toasty, grassy to fresh steamed greens with mild, vegetable-like astringency. In addition to above benefits green tea has also been found to boost the performance of the liver, and prevent arthritis by strengthening bones. Black Tea is allowed to oxidize more completely during processing. The brewed liquor of a Black tea ranges between dark brown and deep red. These teas offer the strongest flavors and, in some cases, greatest astringency. They are strong sources of antioxidants, and they destroys viruses in the mouth and gums and has also been known to widen impaired arteries. Oolong Tea (Chinese tea) is one of the most time-consuming teas to create. It utilizes all of the five basic steps, with rolling and oxidizing done repeatedly. Oolongs typically have much more complex flavor than Green or White teas, with very smooth, soft astringency and rich in floral or fruity flavors. Because of their smooth yet rich flavor profiles, Oolongs are ideal for those new to tea drinking. Applying a little common sense confirms this – all teas come from the same plant (and therefore have the same basic composition), so we expect the benefits to be similar. Slight differences may occur in the varieties (due to the way that these teas are processed), but these are not considerable. So while White tea may provide a few more antioxidants than Black tea, this amount is negligible in relation to the benefits. To build immune strength, both will help pretty much equally. This entry was written on March 19th, 2014 by Renoos. Posted in Food and Health and was last revised on March 19th, 2014.